January 3, 2016 | ProgressTH Living in a city can make it hard to find fresh, healthy, organic food. Space is at a premium, and while farming on rooftops is starting to catch on in some places, as are community gardens in others, the fact remains that for the average person, growing their own fresh food is still a little bit out of reach. But thanks to a growing community of urban gardeners, dropping costs of increasingly accessible opensource electronics, motors, and sensors, as well as advances in LED technology, the ability to turn even the darkest, most uninviting corner of your apartment into a garden is becoming a possibility. The Open Agriculture Initiative (OpenAG) is on a mission to create more farmers for the future of food production. We are developing the open source hardware and software platforms for sensor-controlled hydroponic and aeroponic agriculture systems. Food Computers, as we call them, will serve as tools for users to experiment, innovate, hack, and grow. Every time users grow and harvest, they will contribute to a library of climate recipes that can be borrowed and scaled so that users around the world can gain access to the best and freshest foods. The website has been vastly improved since the first time we've heard of it. Lots of information and documentation has been added. In addition to the large walk-in CityFarm demonstration, there are also tabletop Food Computers the MIT team is putting together at workshops. 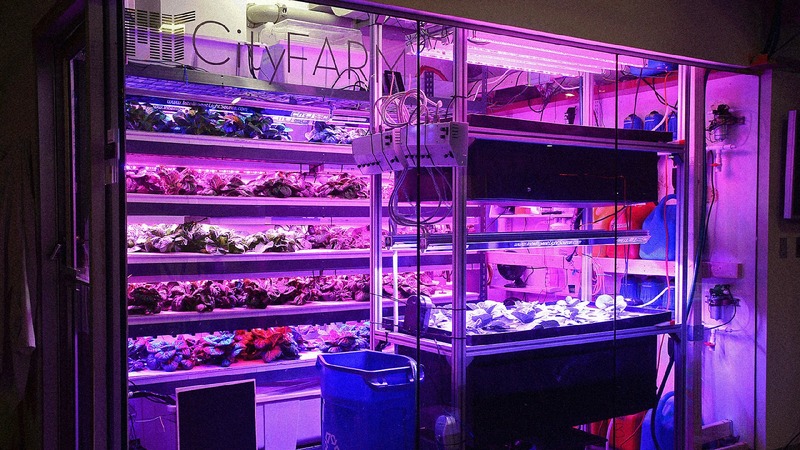 A smaller tabletop version of MIT's CityFarm being developed openly for others to hack and build up upon. Check out Instructables, an online website that gathers tutorials together from people around the world on virtually any topic, and you will find an increasing body of knowledge about indoor gardening there as well. This opensource collaboration, this sharing of ideas, is making it easier for people to get started. Being able to quickly find out what others have tried, what works and what doesn't, and where to begin helps avoid the frustration of starting out on one's own and finding out the hard way the best methods to use. 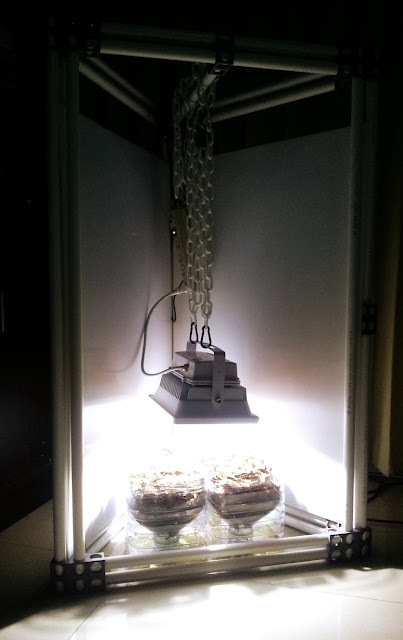 A few key technologies have made indoor gardening a more attractive prospect for regular people. This includes a growing number of kits, or kit-like components that can be combined together with relative ease without much knowledge of design or engineering required. There are also increasingly cheap and powerful LED lights, from those designed specifically for gardening, to powerful 30, 40, and 50 Watt LED floodlights that take the place of fluorescent lights once prolific among indoor growers. Cheap, accessible, and easy-to-use microcontrollers like the Arduino, and cheap microcomputers like the Raspberry Pi make automating and monitoring indoor (and outdoor) gardens easier as well. joints, and a suite of sensors and automated features. More to come! 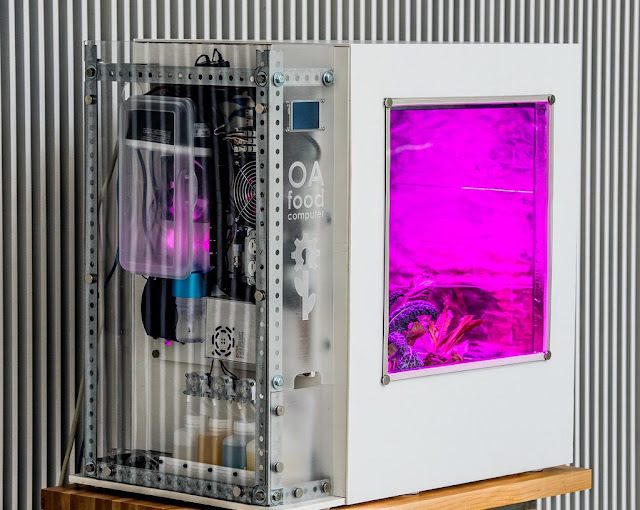 3D printing allows people to create custom connectors, mounts for sensors and electronics, and even systems like automatic fish feeders for urban aquaculture. Alternative energy sourced locally and cheaply will make automated indoor and outdoor gardens more attractive still. As opensource collaborations online continue to make progress regarding hardware and software for actual growing systems, advances in alternative energy will make larger and more elaborate growing system more economical. A future where food production is decentralized and literally on the tabletop of every "consumer" thus making them producers instead, will drastically change the way we think about food. The lengthy supply chains stretching around the globe, requires massive amounts of fuel, energy, labor, and time, to bring food from fields and factories to the table, and often also includes unsavory inputs such as preservatives, chemicals of all kinds, and business practices we surely can do without. By shortening these supply chains from hundreds (or sometimes thousands) of kilometers to the distance between your balcony or rooftop to your table, will truly be an advance for society. Challenges regarding quality control could be taken up by local DIYbio community labs and local institutions like universities and schools, to ensure food people exchange or process into our favorite snacks, deserts, or other food and beverages are safe. It's an exciting future, and it is a future you will probably hear more about and much more frequently. It is also a future you don't have to wait around for. It is a future you can get involved in right now. 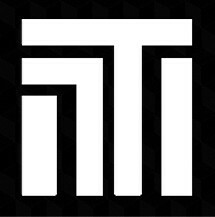 Check out the links we've provided for MIT's project as well as other peoples' projects on Instructables, and keep an eye on ProgressTH, as we'll not only cover the most recent developments regarding urban agriculture, but are working on our own opensource system as well, complete with 3D printed joints to connect common PVC pipes, automated pumps, lights, sensors, and online monitoring system.